Invited by the Russian Orthodox Church metropolitan diocese of Kemerovo, Brother Alois went with another brother and a group of young people on pilgrimage to this city in faraway Siberia for the Feast of the Ascension from May 16 to 19, 2018. 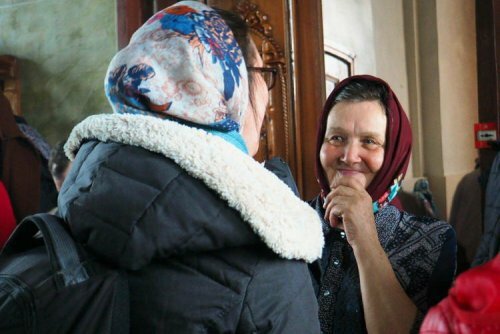 Most of the pilgrims were able to spend two days in Moscow visiting parishes who had welcomed young people for the 2011 and 2015 Easter pilgrimages led by Taizé there, before setting off for Kemerovo. 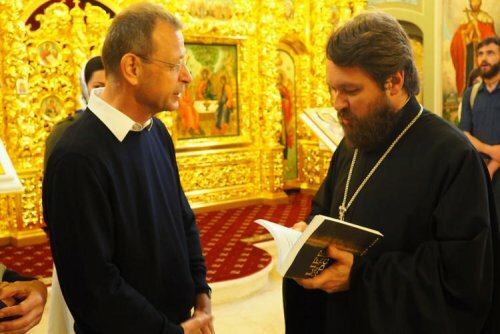 Brothers of Taizé have visited the diocese of Kemerovo several times over the past ten years. Young adults and priests from Kemerovo have also been to Taizé to take part in the youth meetings. The pilgrimage was the result of a long preparation, a friendship built up over the years. Here a brother speaks and some of the pilgrims share their experiences. Young Muscovites organised pilgrimages throughout the city centre to different churches for the pilgrims who came to spend two days in Moscow before the journey to Kemerovo. It was a different way to discover the city to that of the many tourists flocking around Red Square. The spiritual heritage of the city is not restricted to monuments. Living communities of Orthodox believers bear witness to their faith. 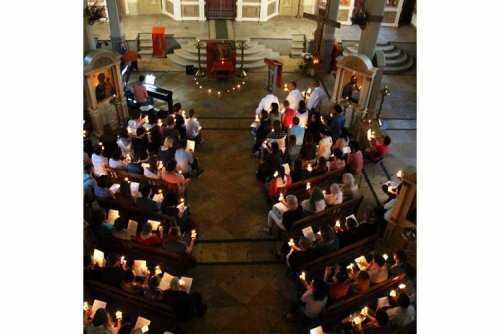 On the first evening, a beautiful prayer took place in a parish, the Dormtion of the Mother of God, which has been visiting Taizé with their priest for over 20 years. Friends from all over Moscow who were able to come and take part. Jakob, Germany: "On Tuesday morning, we attended the Divine Liturgy and were then hosted for lunch by Father Ioann, a priest of the parish of Sts Cosmos and Damian. I asked him what we can do to work on the unity of our churches. He replied that it is important that we take steps to get to know each other better and that we love more. I am happy that this pilgrimage we are on could be both. With everything I experience here, I learn more about the Russian Orthodox Church and in the way we are welcomed and hosted in the churches and at our host families I feel the love that we can share as Christian brothers and sisters. Father Ioann said that in the past we can see a "history with a minus“, focusing on divisions and conflicts. We should try and write a "history with a plus“ in finding and creating moments and projects of unity and communion. I hope that this pilgrimage can be a part of this "history with a plus"." In Moscow, the group was received by Metropolitan Hilarion (Alfeyev), President of the Department of External Church Relations for the Moscow Patriarchate, at his Institute of Ss Cyril and Methodius. Alicja, Poland: "In Ss. Cyril and Methodius’ Institute, it was really amazing. We had a great guide, who explained a lot about two churches there. We learned the meaning behind the numbers of domes on the churches as well as the meaning of colours. Also the international students of the institute welcomed us with beautiful liturgical singing"
Philipp, Australia: "Tuesday evening all of us headed to one of two of Moscow’s airports, depending on the airline we booked to travel to Kemerovo with. Both flights left late on Tuesday evening and even though the flight time was only four hours, we arrived early Wednesday morning in Kemerovo, due to a four hour time difference with Moscow. That wasn’t the only difference, Kemerovo had a cool 3C on the morning of arrival compared to the last few days of nearly 30 degrees in Moscow, it’s always interesting stepping in and out of an aircraft, from one world to another. Our landing approach to Kemerovo was impressive, with views of the city amongst the landscape of forests and rivers of western Siberia." Judith, Netherlands: "Early morning - after a beautiful view over the Siberian landscape - we arrived to the city of Kemerovo. Together with two other pilgrims, I was warmly welcomed by a family of four. After an elaborate breakfast of pancakes and fruit, we all caught up on some sleep. And another meal was waiting for us when we woke up! A joyous moment to get to know each other a little bit." In the afternoon, we travelled to the industrial town on Leninsk-Kuznetskii. Welcomed by local priests, lunch was offered by the sisters of the St Seraphim Monastery. Afterwards we climbed into a bus and the priests showed us the different churches of the town, revealing beauty in a region where everything revolves around the coal industry. Dina, Moscow: "There we were at the end of our first day in Siberia, after a warm welcome in the families of Kemerovo, a trip to Leninsk-Kuznetskii, a visit to a monastery, a tour around the city on which we visited about six different churches and participated in the Vespers. The day did not finish yet and we have already been warmly welcomed in two cities by the people who saw us for the first time. We did not have much time to get to know each other with the day being so busy, full of shared experience, prayers, meals, but I could feel that this pilgrimage was bringing us together in its own way. So there we were going by bus along a bumpy road of Leninsk-Kuznetskii in the Siberian twilight, an unusual company indeed - two brothers of Taize, 29 young people from all over the world and several local Orthodox priests, who welcomed us. We were heading towards a place of our accommodation for the night and almost nobody knew what exactly it was going to be. For a passer-by it might have looked like a group of people on a bus, sitting, standing, talking to each other. But I could not believe that it was all real, it was more than I dared to imagine. It was a journey and a meeting so special that I am still struggling to find words. But it was all very real - the bus, SIberia and the bumps on the road. We were discovering the country which was so different from what I am used to. We were looking at the beauty of the Orthodox faith and the presence of my friends from abroad helped me to get a new perspective, what a gift it was to learn how they see it and what discoveries they make. There we all were heading towards the unknown, tired after a busy day but full of trust and joy. I also thought about all the obstacles and difficulties that we had before meeting in Siberia, a lot of effort were put to arrange everything, all the agreements, invitations, visas and other kinds of arrangement. Each one had to make time for the pilgrimage and prepare for it in one way or another. Yet there we were. Together. Because we wanted it so much and even more because He prayed " that all of them may be one, Father, just as you are in me and I am in you"." On the feast of the Ascension, we participated in the Divine Liturgy in the town of Salayir. After the service, our pilgrims were asked to sing "Bogoroditsye Dyevo", an Orthodox hymn to the Mother of God sung often in Taizé. This led to some special moments with the congregation after. Claudia, Germany: "After the liturgy in the Church of Salayir: I met a wonderful woman in the Church of Sts. Peter and Paul in Salayir. She approached us and asked us where we come from. When I said "Germany", she said that it’s so wonderful that we are here and that she hopes there will never be another war. Then she left and came back in, crying. She told us that she had seen a documentary on TV about Russian and German soldiers. That the Russian soldiers protected the young German soldiers because they thought they were too young to die. The woman said that she understood that many of the German soldiers were forced to go to war and did not do so out of free will. She said that she was crying for both, the Russian and the German soldiers. We both cried and hugged each other. This meeting touched me very much, as my grandfather was forced to go to Russia as a young soldier when he was 19." After the liturgy, we visited the "Firefly" Orthodox nursery school, where the children played several sketches about Russian traditions and the life of Ss Cyril and Methodius. Returning that evening to Kemerovo, the Friday morning gave the possibility to pray during the Divine Liturgy in the Cathedral Church of the city before meeting with the Orthodox scouts. They organise many activities for their members including summer camps in the Altai mountains, not so far away, during which the Liturgy is served and there are long treks through the beautiful countryside. 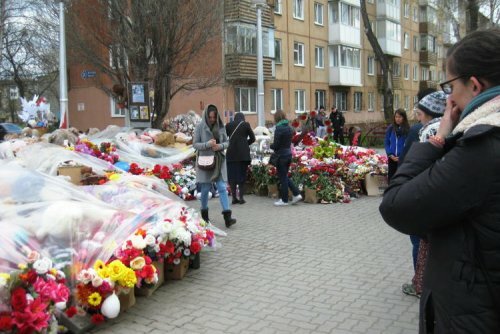 Visits continued to the Orthodox High School of Ss Cyril and Methodius, where we were warmly welcomed by the staff and pupils and then in the afternoon, we prayed at the site of the fire tragedy which took the lives of 70 people in March, many of whom were children. Father Sergey, the Orthodox priest who did so much to welcome us, told of a grandmother and her two grandchildren from his parish who perished in the blaze. A makeshift memorial of flowers and icons have become a place of reflection and prayer. Friday evening brought the opportunity to pray together in the Catholic parish. Bishop Josef Werth of Novosibirsk came to join us with young people from his city and from Tomsk and Barnaul. 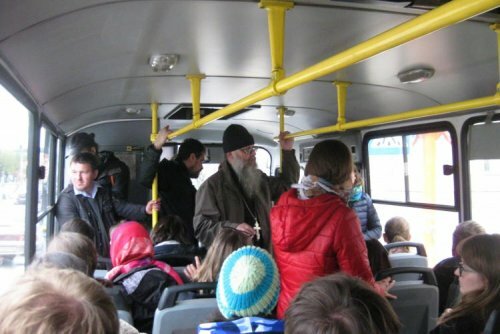 The brothers were also able to meet with Metropolitan Aristarkh who so kindly invited us on this pilgrimage. He welcomed us very warmly and spoke of his desire to continue our contacts. Our pilgrimage closed with a marvellous meal at the house of Fr Sergey. All the pilgrims helped in its preparation. There we were chopping tomatoes, cutting potatoes, making soup and preparing the meat. A huge log fire outside kept us warm. What a welcome we had received during these days! Claudia, Germany: "I was astonished and overwhelmed by the great hospitality, warmness and simple friendship we experienced. Many of the people welcoming us had never been in touch with Taizé before. And yet, they welcomed us like old friends, they trusted that we are "good people", gave us a bed and food in their homes, prayed with us and shared their love and compassion." Aleksandra, Poland: "What was especially surprising and moving for me it was the Russian people’s attitude to others. Few times people I barely knew or even strangers came to me, and shared very personal stories from their lives. Also our host families were so open and frank, so eager to talk. Maybe that’s a part of the culture: lots of get-togethers while drinking tea... It was the same after the Divine Liturgy in the churches as well. This is touched me and what I miss a bit in our more digital and much more individualistic "Western" society - direct contact with other human beings. Many greetings and thank you one more time for the opportunity to taking part in that pilgrimage! I would like to add, that this was truly a pilgrimage of trust experience for me, when I forced myself to leave my comfy life, so God could lead me once again and show the beauty and diversity of the world, both outer and inner." Julia, France" "I call you friends": and that’s what we called each other, fellow pilgrims, host families, the priests and those who welcomed us. For many of us, this pilgrimage was our first meeting with our Orthodox brothers and sisters in Russia. Through these moments of fraternal sharing we got to know them and their liturgy and deepen our own faith. Knowing my brother or sister, even if the way we celebrate our faith is not the same, teaches me humility towards my own faith and helps us become peacemakers, all united around the same Christ in our midst, like he was throughout this pilgrimage."